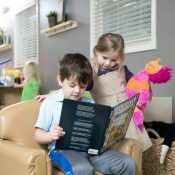 Each day your child will engage teachers and peers to learn about our wonderful world and develop social and academic skills. As a Christian or non-Christian parent, understand that Seven Branches Academy will never teach the latest educational fad just to be popular. If it goes against the teachings of Jesus, it goes against Seven Branches’ teachings. We use the Pinnacle and Abeka curriculums, which are based on monthly and weekly themes. Pinnacle is designed to assist teachers in planning programs that encourage children to develop their emerging skills in all developmental areas while discovering and experiencing God’s love. Based on these principles, Seven Branches Academy delivers a positive message to children regarding who they are in Christ along with developing needed social and emotional skills, language development, math, reading and writing skills, as well as the ability to reason, adapt to change and make wise choices in life. We value your children’s God-given abilities and talents and will work with your precious ones to develop and understand these talents and gifts.